Tomorrow we will kick off the Family Proclamation Celebration, which will run from Sept. 17- Sept. 30. You can read more about it here in this article that was published in LDS Living Magazine. Remember to get your own blog posts ready for the Blog Hops. 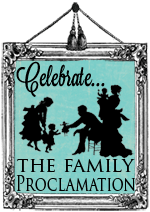 • Wed. September 26: Family Proclamation Photo Essay – pair photos of your family with different phrases from the Proclamation. And there will be some fantastic guest posts here and on the other participating blogs for the next 2 weeks. I’m excited. Are you? Let’s do this thing.